It’s October in Arkansas, and the weeks ahead will bring pounds of falling leaves on and around your home. Mark your calendar now to clean out your rain gutters (or hire someone to clean them). It’s best to choose a time before the busy Christmas season since January-March is typically “the rainy season” of Central Arkansas. Clogged gutters can: 1) become very heavy with leaves+rain, causing them to pull away, 2) prevent the rainwater from being routed away from the exterior of your home properly. 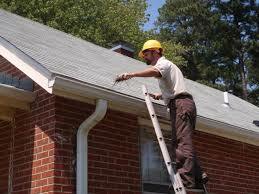 Either of these can lead to some very costly home repairs for you later on. If it’s not something you can safely do yourself, hire someone to do it. It’s an “ounce of prevention” toward protecting your investment in your home. If you’re thinking you might put your house for sale on the market within the next 6 months, this simple maintenance item is critical. Walk all around your house as if you were a buyer. Notice the things that need attention, make a list and schedule to have them done. Don’t wait for your buyers (or their home inspector) to notice gutters that have pulled away from the home, rotting wood on the facia or exterior boards or cracked bricks at ground level. These things could cost you a sale – or even an offer. Buyers are informed. Get these items addressed and repaired properly beforehand. This information is provided by TEAM BRINKLEY, Keller Williams Realty. It reflects our opinion & is not meant to take the place of a professional service person’s opinion or advice. We’re Realtors* & We’re Here to Help.